Home > Heart Conditions > What is Atrial Fibrillation? Although a normal heart beats in a pattern called sinus rhythm sometimes it can beat irregularly. 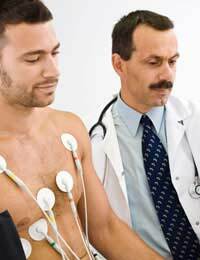 The most common form of irregular beating is called atrial fibrillation. Atrial fibrillation occurs when the two upper chambers of the heart, the atria, fail to supply the lower chambers with the correct electrical impulses.Episodes of atrial fibrillation may be only a one time event and no investigation takes place, or it can be recurrent or chronic, when the heart stays in this rhythm for more than 7 days. Although a person may well have atrial fibrillation without any symptoms, common ones include palpitations, feeling faint or occasionally episodes of chest pain.Sometimes a person may feel as though their heart is racing and will want to sit down and wait until these feelings subside, whilst for others the symptoms may be severe and will need medical attention as atrial fibrillation is often secondary to an underlying condition that will almost always require intervention. Atrial fibrillation may well go undetected for some time if there are no apparent symptoms, but if a person does go to their GP with any of the regular symptoms, the doctor will send the patient to the hospital for tests to find out the cause of the symptoms. Tests that are used to diagnose atrial fibrillation include an ECG, or electrocardiogram, which monitors the patterns of the heart and interprets the electrical activity and prints it out on paper or displays it on a screen, which can then be read and analysed by a trained professional. In the presence of atrial fibrillation, the doctors may well require further tests to find out if there are any other underlying conditions that could have exacerbated or caused the irregular heart beat. This can include blood tests, lung function tests, exercise tolerance tests, x-rays and echocardiograms. There are many, many reasons as to why a person may have developed atrial fibrillation, including, though not limited to, cardiac problems such as mitral valve stenosis, heart disease, high alcohol consumption, chemical intolerance or poisoning, lung diseases or problems affecting the thyroid gland. As atrial fibrillation interferes with the normal conductivity of the upper chambers of the heart, a potential problem could be that the blood in this area becomes stagnant, resulting in higher risk of stroke occurring. Due to this it is important to try and return the heart to it's normal rhythm, which can be done by performing a cardioversion, in which electrical impulses are passed through the heart aiming to return the rhythm back to normal pattern. There are many drugs available that aim to reduce the heart rate, therefore eliminating the ‘racing heart’ symptom, that will also help to return the heart to it's normal rhythm, your doctor will take a full medical history and examination before prescribing any of these drugs as careful selection is needed in the presence of certain other medical conditions. Anti-coagulation medication are those that help to prevent the blood from clotting whilst it is more stagnant, and these drugs can be given temporarily until the heart returns to a normal pattern or permanently if the fibrillation is of a longer duration or persistent. Atrial fibrillation is a fairly common problem, especially in older people. It can be an indicator that a more serious problem is occurring in the body and needs accurate diagnosis, investigation and treatment by a doctor.Symptoms can be quite frightening for the person and can cause worry and panic, making the condition feel worse.It is very important to always see your doctor if your experience any problems associated with the heart.